We took lots of pictures from every angle we can imagine, and admired its beauty that changes everyday as the tide goes up and down. 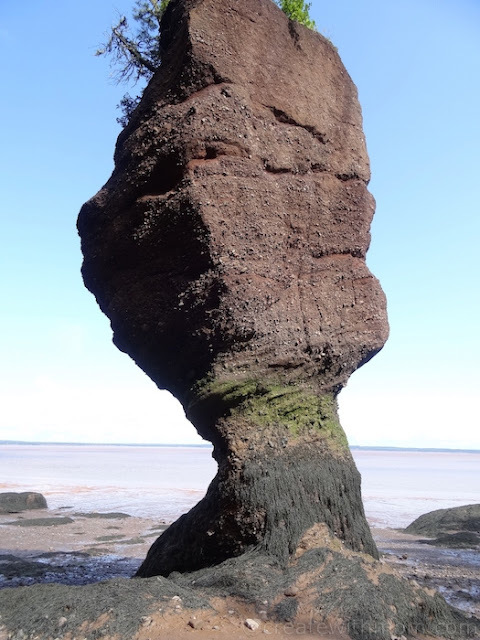 The Hopewell Rocks close to the Fundy National Park is open from mid-May to mid-October. We went down the stairs to the ocean floor. There are ropes to prevent people from going too close to the caves because the rocks can fall. Details on how the tides work depending on the gravitational pull of the sun during the new and full moon phases. See how massive the rocks are. 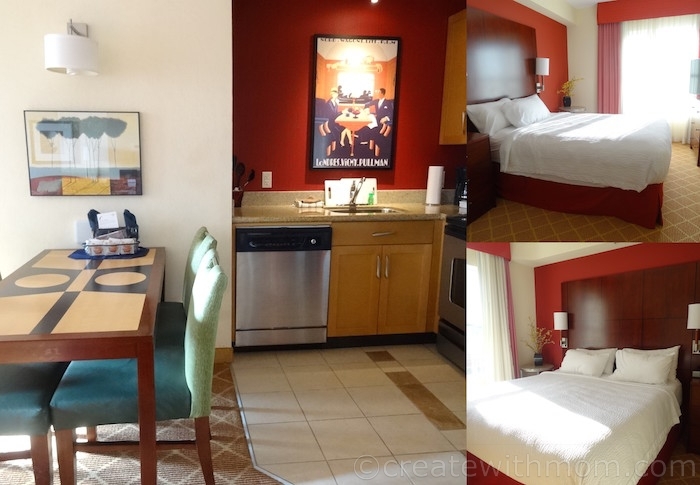 We enjoyed our stay at the Moncton, Marriott Residence Inn. This homely stay was relaxing. The Magnetic Hill close to Moncton is a fun place to go and experience the optical illusion, and how gravity works. We drove the hill, as well as walked it to experience it. Watch the video to see how this vehicle comes down hill from where the white pole is. To roll downhill, the driver has to put the vehicle on neutral and only control the steering wheel without touching the breaks or the accelerator. We went to Alma, a small fishing town close to the Fundy National Park. This is a wonderful place to stop by and enjoy a seafood meal. 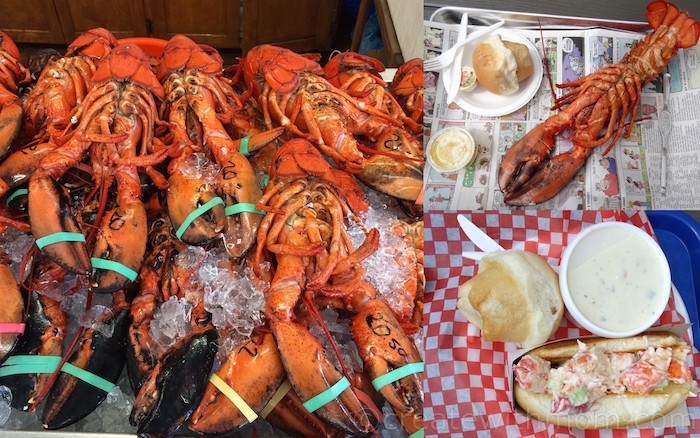 A fresh lobster meal at Alma is fabulous, so while there do take the time to enjoy. We loved our quick visit to the Fundy National Park. It is so beautiful we wanted to stay overnight and camp. There are lots of trails marked easy, moderate, and difficult, and the opportunity to spot wildlife at the park such as bobcat, Canada Lynx, Red Fox, Black Mear, moose, deer, salmon, eel, and more. It is a wonderful place to share memorable moments with family and friends. There are Red Chairs placed by Parks Canada in beautiful scenic places for us to sit back and relax while looking at Fundy’s spectacular scenery. 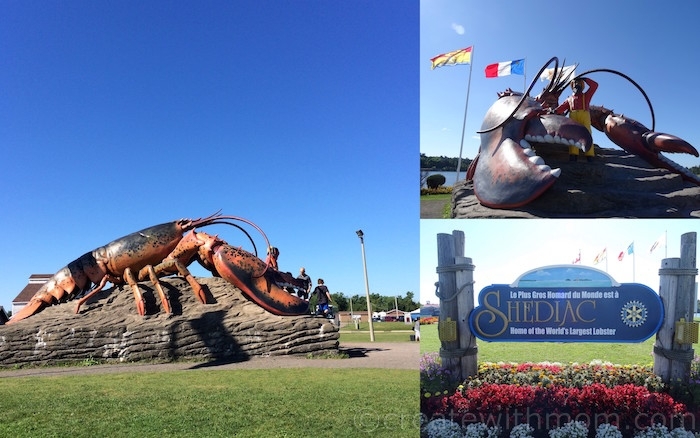 We went to Shediac, bought souvenirs and took pictures with the World’s Largest Lobster as it celebrates its 25th anniversary. We had lots of fun heading back home to Toronto in the Toyota Sienna. Children enjoyed looking outside through the wide windows as well as through the moonroof. When we were coming we found the highway ride smooth, although there was a lot of wind and rain. We found the steering to be responsive when going along the curves and the maximum speed on the highway of 110km. There was minimum noise, and you don't feel the wind dragging the vehicle. I like the size and shape of the vehicle, which is perfect for families with children. This is a place I would love to check out for myself. Beautiful!! I am a little biased about the areas that you have featured as we currently live in NB near all of these wonderful places. I can tell you that they are worth the visit! Wow, it looks so beautiful! I have always wanted to visit the east coast. This is wonderful. I live on the West Coast but have a dream to visit the Bay of Fundy. If only cross Canada travel wasn't so expensive! WOW it's gorgeous, I've never been east of Quebec City and would LOVE to visit New Brunswick. I can't believe how many nature made sites there are there. I a beautiful place not to mention my favorite meal; lobster !